My family loves to play games. Particularly, they love to play games where they have to do all sorts of strategizing and planning ahead. I'm not quite as big a fan of those games, mostly because someone always seems to feel picked on, and I just don't like listening to the "It's not fair!" complaints at all. I'll confess that as they have gotten older, that behavior has diminished. However, it hasn't vanished. A cooperative strategy game, though, gets my attention. Because then if someone is upset that "It isn't fair," everyone else commiserates. 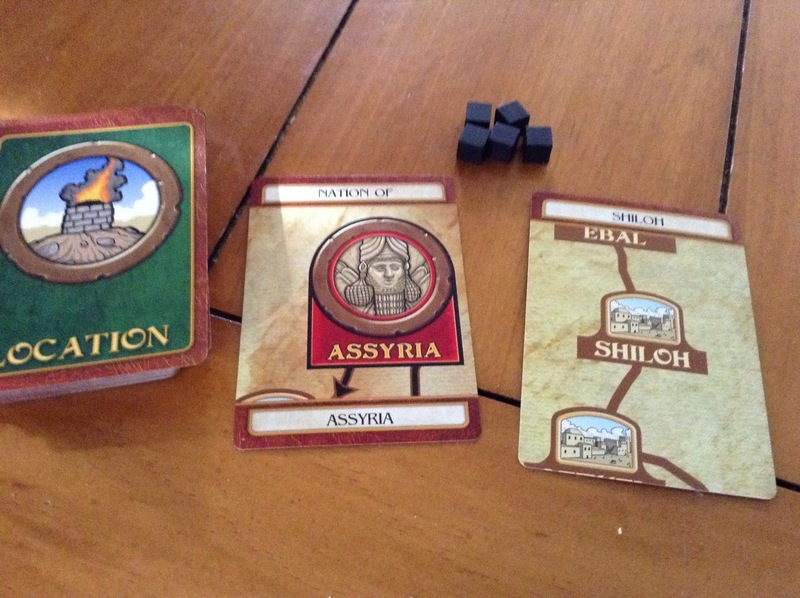 A cooperative strategy game with a biblical theme is even better. 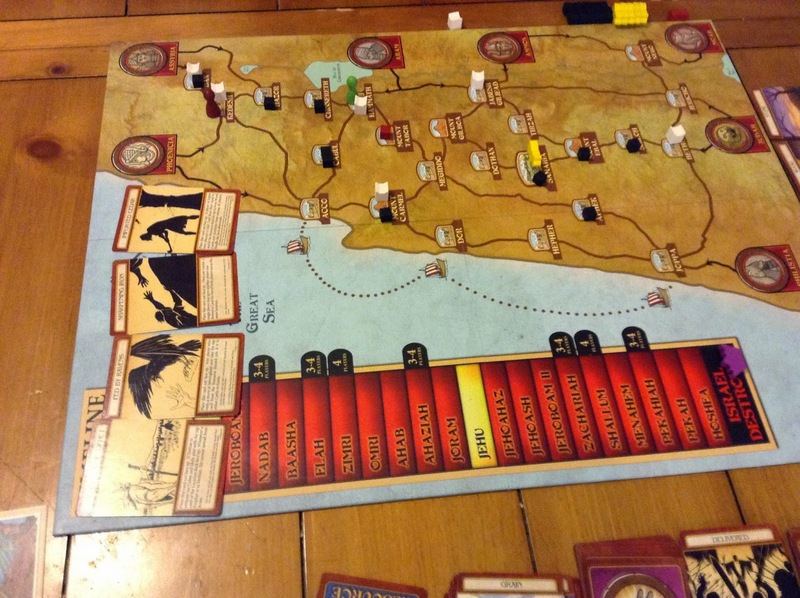 And this game has already helped all of us to be more familiar with the geography of Israel. 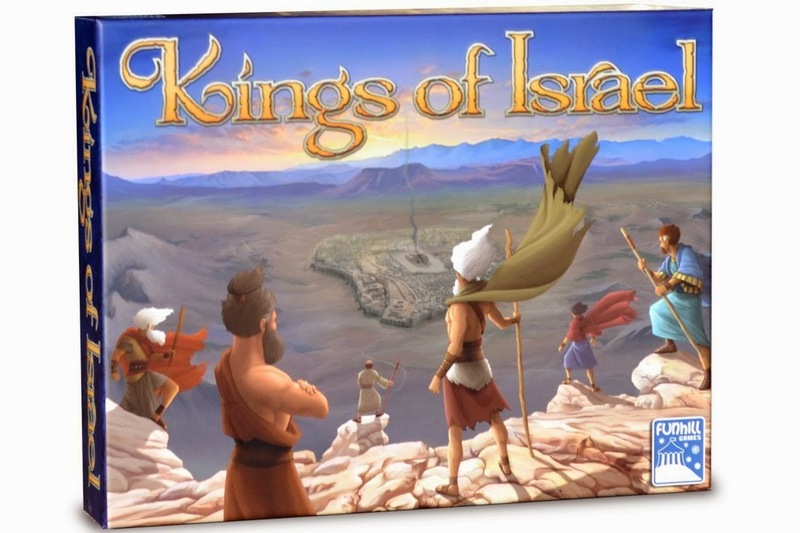 Kings of Israel from Funhill Games is a fantastic game for 2-4 players, intended for teens and older. However, both my 9- and 11-year-olds were able to play and do well. They have had some strategy game experience already, which helps. But since this is cooperative, it seemed pretty easy to integrate them. The basic idea of the game is that you represent prophets in Israel, and you are trying to stamp out sin, destroy idols, and turn people back to the worship of God. This is easier to do during the reign of good kings, like David, and harder to do during the reign of, well, most of the kings of Israel. 1. 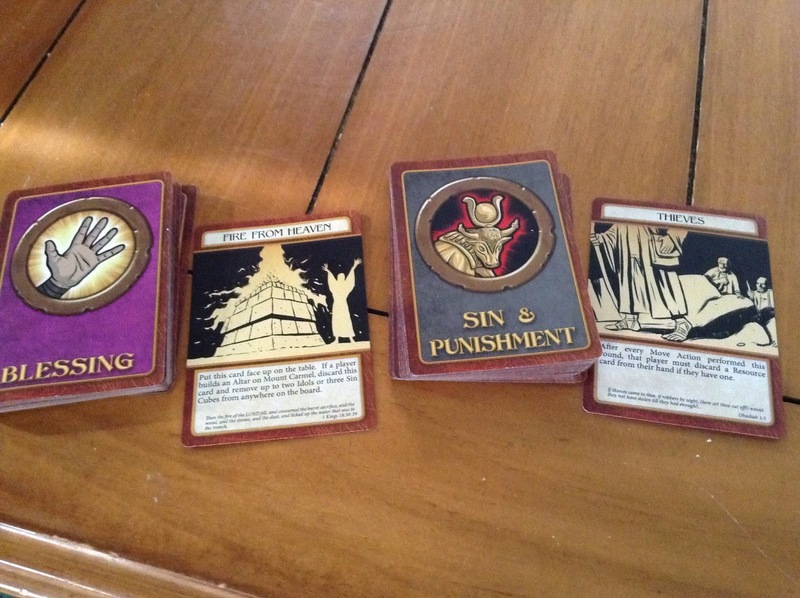 You draw a Blessing or a Sin and Punishment card, depending on whether it is a good king or a bad king. This results in some sort of good or bad thing happening. 2. Sin increases (represented by black cubes) based on drawing cards from the location deck. 3. The prophets go to work - the players take turns, and each gets to take four actions. Actions include moving, preaching (to remove sin from their location), destroying idols, acquiring resources, building altars, making sacrifices, or giving resources to another prophet. At that point, it moves on to the next king, and the above phases repeat. Obviously, that is the simplified version. It is slightly more involved than that, with idols appearing in sin-filled locations, and sin spreading, and short-lived kings having an abbreviated cycle, and so on. One of the best parts about the game? The oldest player goes first. That's always me. Ha ha ha ha. My kids think it is funny that I'm so tickled by that. I would highly, highly recommend that you start by playing the easy version, where you get to lay out your cards so that everyone can see what everyone else has. There is another way to obtain Blessings in Easy mode too. It is possible to win playing in Easy mode. I'm not convinced you could win in regular mode, at least not until you are a bit more familiar with the quirks of the game. That, there, to the left -- that is easy mode. Everyone can see that I have two Stone and one Wood. So everyone knows that if they give me a Gold, I can build an altar. Makes it a lot easier. Our opinions: We have played both Easy and Regular versions. We haven't dared to try the expert version, where a false prophet is introduced. We have played with 2, 3 and 4 players. What is amazing about this game is that it is a lot of fun no matter how many players. It is a very different game with only two, but still fun. And significantly quicker to play. It is also very different each time you play. One of the first things you do in the game is to draw an Ability card that gives your prophet certain strengths. If you draw the Sailor card, you are likely to be mostly staying near the coast of Israel. Other cards make it a good idea to stay in the mountain areas, or near the borders with other countries. The mix of abilities changes your strategy, and definitely mixes up the game play from one game to the next. There is a great balance between the random factors (abilities, blessings, punishments, where sin pops up, what resources are available) and the strategy portions. 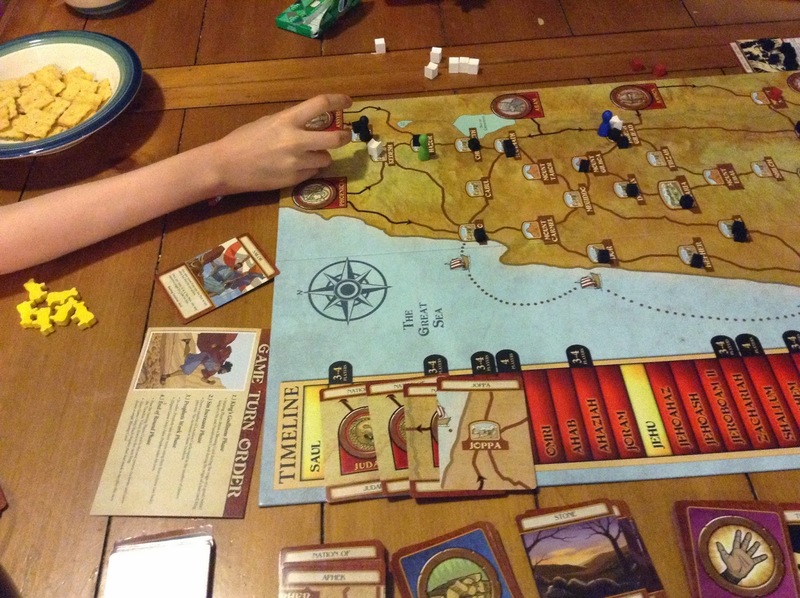 This is an amazing, fun cooperative strategy game and we will play it over and over. While putting together this review, I ran across a little note in the Rulebook about a Bible Study Rulebook. That got my attention, and made it so I didn't post this review last week as planned. It turns out there are three Bible studies available right now, with more (probably) to come. One study covers the kings of Israel, another covers the prophets, and the last one covers Israeli geography. These can be used in a variety of ways. 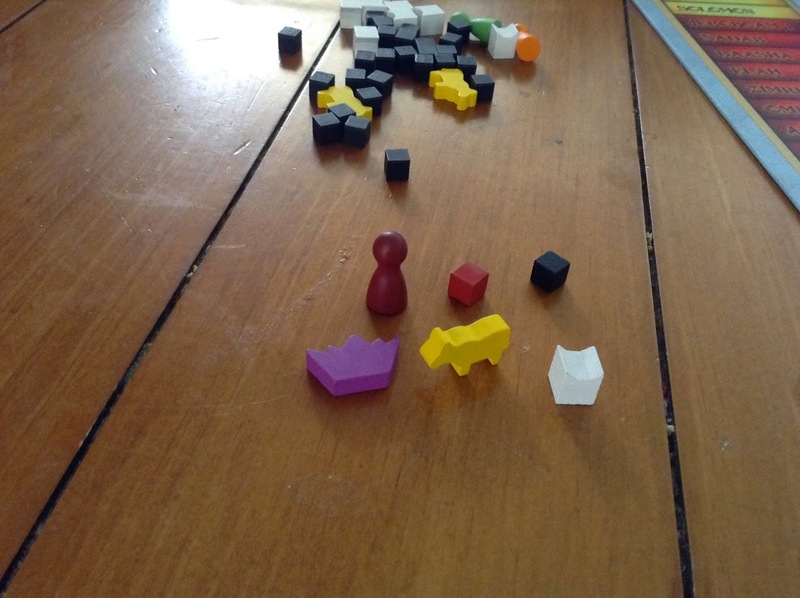 One suggestion for the Kings study is to ask the questions at the beginning of each "reign" and if they get the questions right, you begin play for that round. If they get a question wrong, there is a hint. If that doesn't help, there is a Bible verse to look up. Since my kids do already know a fair amount of biblical history, this seemed a good choice. Between them they know quite a few of the answers, and it doesn't take long to look up the others. I love that they are actually learning something in the process, and I look forward to working through the other two studies as well. Bottom line: This game is great, whether you play it simply as a strategy game, or whether you use it as part of a family Bible study, or if you take it to a classroom setting. 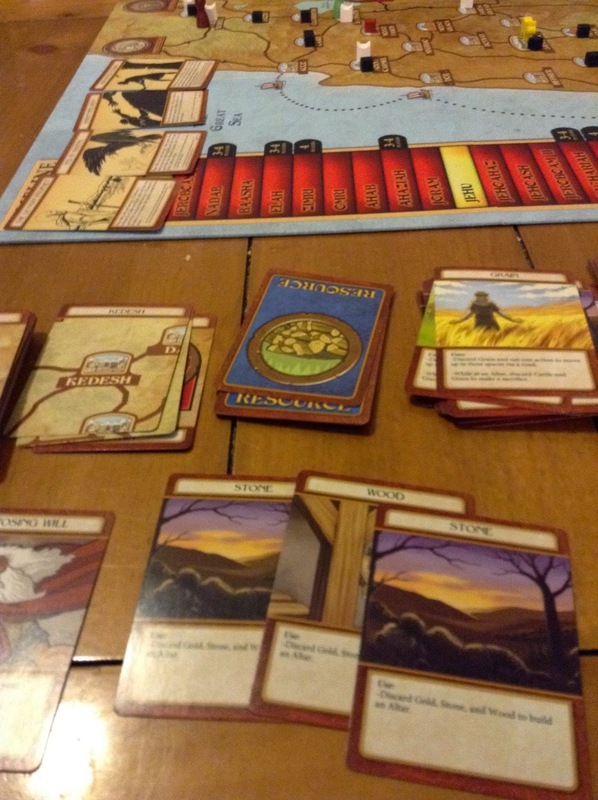 Homeschool Blogging Connection is giving away a copy of this game, among other great prizes, in their April giveaway. If you don't win it, you really ought to purchase it. This game is fantastic. I just added this to my Amazon wish list!! Looks like an AWESOME game! Thank you!